The Mode setting on the Samsung Galaxy S 5 camera is where you make some basic settings that describe the situation under which you will be taking your shot. The default is a single picture in Automatic mode. The Mode icon is a round button underneath the button for the shutter release. Tapping on this icon brings up the Mode options. Auto: Taking a single photo at a time is the default setting, which assume average light. It’s a good place to start. Beauty Face: This mode automatically hides subtle facial imperfections. (No guarantees!) 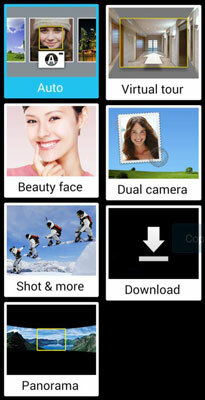 When you use the front-facing camera to take a selfie, the camera uses the Beauty Face setting as the default. Shot and More: This setting takes a quick series of three images per second and then uses them to create a moving image against the background. The icon gives you an example where the skier appears to be moving against a fixed background. Panorama: Take a wider shot than you can with a single shot. Press the Camera button while you rotate through your desired field of view. The application then digitally stitches the individual photos into a single wide angle shot. Virtual Tour: This mode lets you take a series of still photos and tracks the relative orientation of the two shots with a grid map. This feature may be familiar if you have used “Street View” on Google Maps. You start with a view in a particular direction and then scroll left or right to see more. The S 5’s feature is similar, only it can work both inside and outside as you move around the viewfinder. Dual Camera: You have two cameras on your phone, one facing the back and one facing the front. This mode lets you take pictures from both at the same time. Download: Tap this icon to find other modes you can download to your phone’s camera. There are new capabilities, both for free and at a fee, that stretch your creativity.